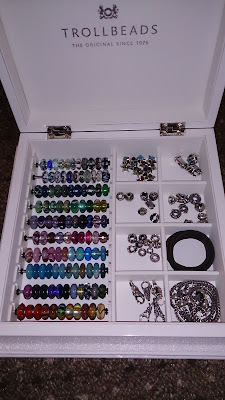 If you've read my piece on Everything But The Beads you may have noticed my shiny white jewellery box, I did promise to show you just how much it holds. 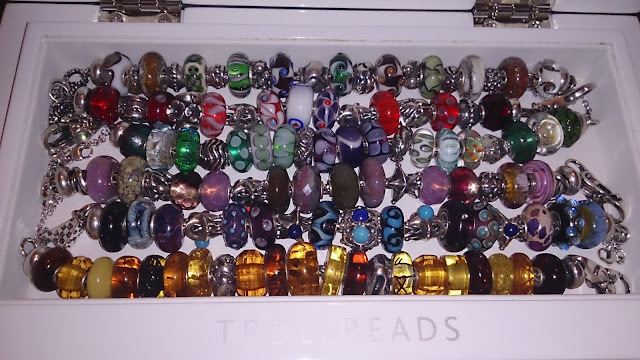 For comparison, and just because I have the photos handy, here are the before (empty box), during (full of beads with some bracelets made up) and after (many bracelets made up and a few beads left in the box) photographs. So just to remind you, here it is lovely and empty... The box is much smaller than a vinyl album sleeve, or for those of you under 30, it measures 8.5 inches square and 3 inches high, it also comes in a protective box which is very handy as the plastic cushioning holds beads quite nicely for bead play... or when you need to dismantle 9 bracelets to take photos of an empty Jewellery Box! 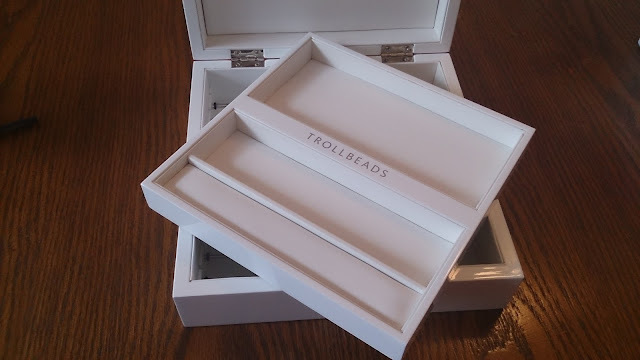 When you open the box up you have a removable tray with 3 sections, the larger one at the back will definitely hold 6 x 17cm made up bracelets snugly, the middle sections holds 3 in the same way, and the raised section holds 1. I have to admit I have no idea why this is raised or what it's original purpose is but maybe someone will be able to tell me? 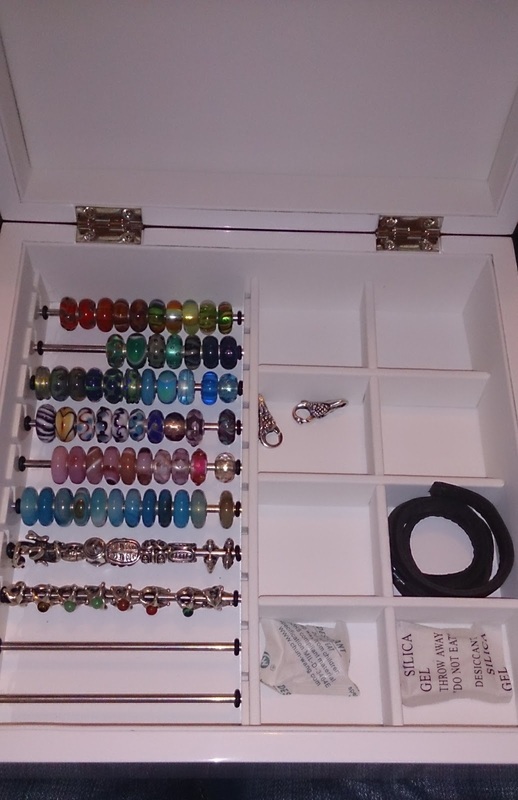 Underneath there are 10 rods to thread beads on, I find I can fit between 10-12 depending on the thickness of the beads, you also have 8 boxed compartments which are ideal for accessories or more beads! As soon as I got the box I wasted no time at all in filling it full of beads and the bracelets I had made up at the time, I was desperate for this to arrive as my two travel cases were stuffed to the gills with beads and they kept pinging out every time I opened them, plus I had no more room for made up bracelets and I had the embarrassing issue of never being exactly sure of what beads I had to hand. (The problem amazing result from having had such a manic collecting period over the previous few months). 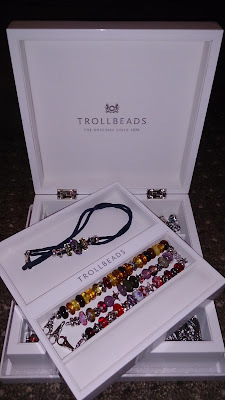 Those of you who've been reading Curling Stones for a while know that I love to make and break up my bracelets on a regular basis and that it's quite rare for me to use all my bracelets and have them made up in semi-permanent combinations. 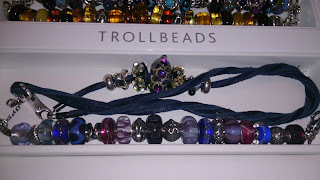 However, being able to see my beads in this way really helped me to make new bracelets that I'm keeping together for longer, whether this is because I have somewhere to store them properly now without compromising bead space, or whether this is because I'm making bracelets that have a longer shelf life, or indeed, whether it's because I have more of both beads and bracelets so I can still get variety whilst I have them made up... who knows? If you're wondering why the photos don't match up so nicely as comparison shots it's because I don't always plan out blog articles, my blog often tells the stories that I've already told my friends, the photos I take on my phone as and when I do this, individual moments in time but unless I've already had the idea for the blog I don't always remember to take photos in the "best way" for the article. 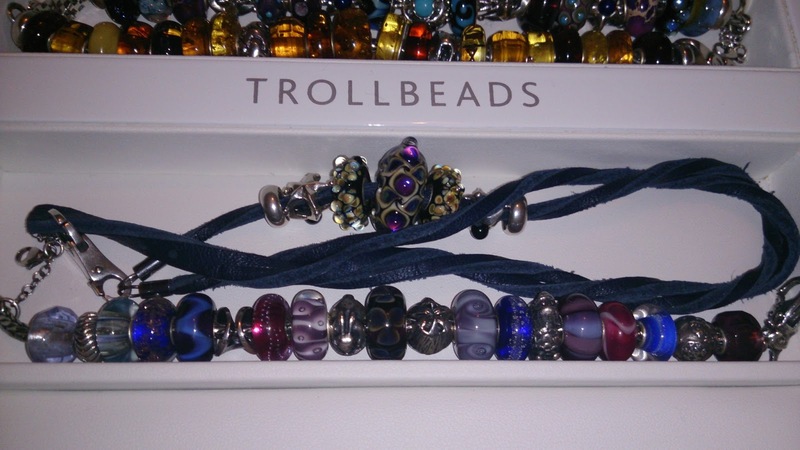 The sharp eyed amongst you will realise that this was before I'd cracked my Blue Galaxy Bracelet which was still a work in progress at this stage and it was also before Easter and my Easter Swap Bracelet was made! 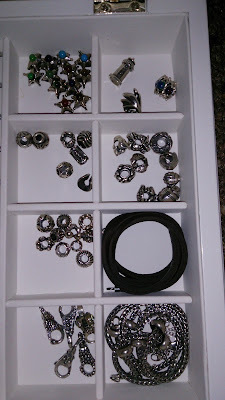 As I'm looking at the box now, the worrying thing is how quickly it can fill up even with all the bracelets made up... oops! 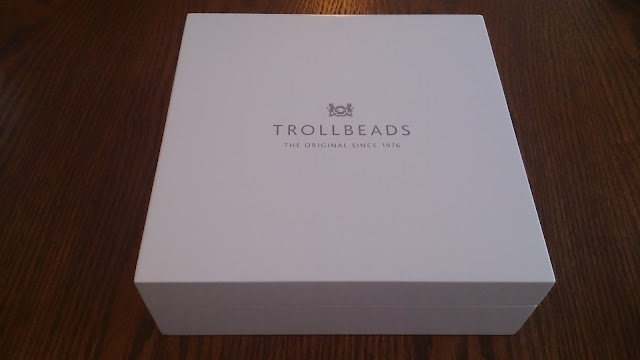 It really is a fabulous box, but like me, you WILL out grow this one too, haha! I was thinking that as I was looking at it this morning! I wish my woodworking/creative skills were more advanced... but there's the rub, do you buy bigger to start with knowing you *will* grow into it or buy by stages as your collection grows... 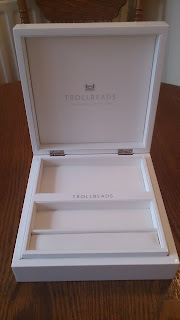 I've still got my 2 travel cases, which came in handy last weekend whilst I was travelling (well I guess they do what they say). 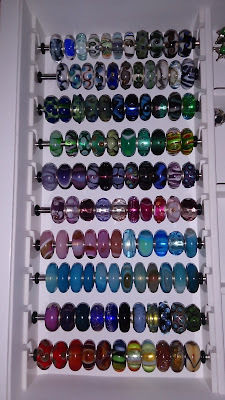 They'd be hard to use as overspill now though as I've got used to being able to *see* my beads properly when on the rods. 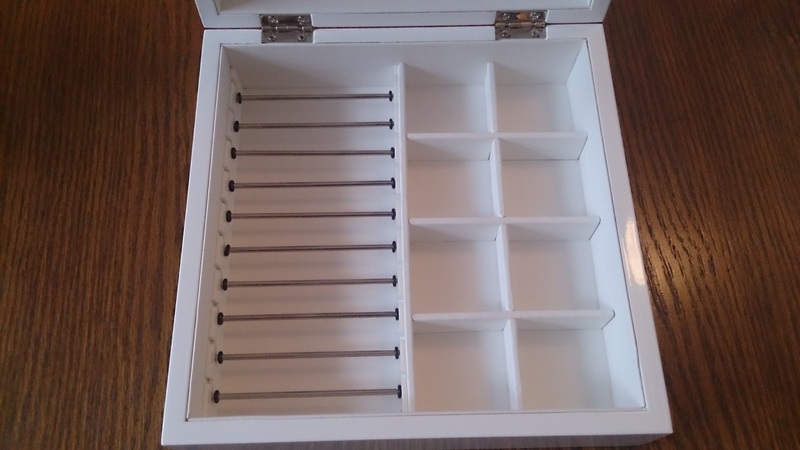 There are some still around but it's a case of finding a retailer who has one in stock. Good luck with your search, fingers crossed for you and do let me know if you managed to find one! hello..really beutufull! can i asc u if u have mothers rose??? i need have this beds!! please found me en Facebook anna lova! I wish you lots of luck in your search for one, it's a lovely bead.